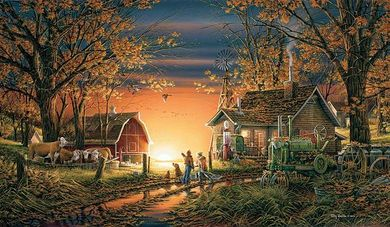 Terry Redlin Open Edition Fine Art Canvas:" Morning Surprise"
Size: 14"H X 24"W and , 23"H x 39-1/2"W - Select size and framing from option area. About The Art: "Autumn leaves rest gently on the milkhouse roof and tractor hood while the children have begun their morning chores. Suddenly the silence is broken as five mallards fly low through the trees. In startled surprise the children and pets look up to catch a fleeting glance. In a blink all is again silent and the business of the day will continue. Only the windmill's rotating squeak is heard as water cools the fresh milk stored in the pump house." With 2 sizes and framing options: Encore open edition canvas art print made from the original oil painting. Image size, 14" x 24". Framed size, 20-1/4" x 30-1/4" and Open, unsigned edition from the Museum Canvas Collection which offers the size and majesty of Terry Redlin's original oil painting. Image size, 23" x 39-1/2". Framed size 31" x 47-1/2".